Circulan 4in1 is an FDA-approved, all-natural food supplement containing four herbal extracts that work synergist. CIRCULAN is a soft gel capsule that contains extracts from four (4) potent herbs that work synergistically for proper blood circulation. It is a food supplement that has approved FDA benefits. CIRCULAN FAN of the MONTH is BACK! Have a chance to WIN 3000 worth of SODEXO Gift Certificate and Gift Packs from CIRCULAN. 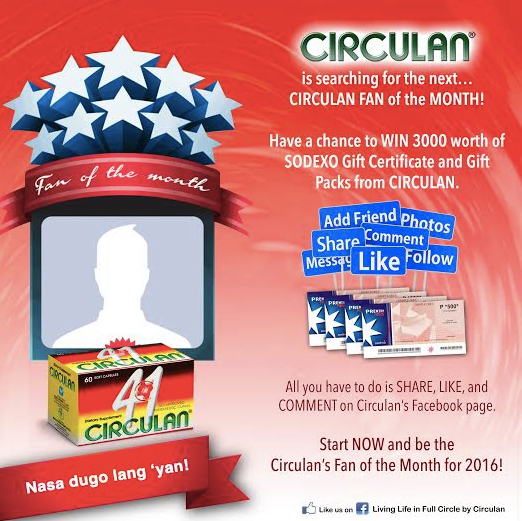 All you have to do is SHARE, LIKE, and COMMENT on Circulan’s Facebook page. Are you the next Circulan’s Fan of the Month? Open for Philippine residents and Circulan fan on facebook page.